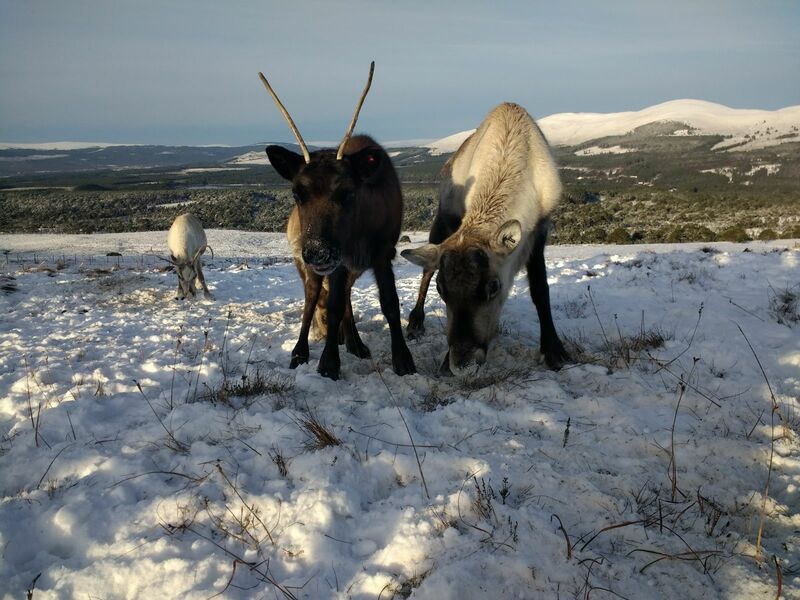 For the previous few months we have been joined by a new reindeer herder called Kate who helped us out over the busy calving period. Kate was so brilliant to have around we asked her to stay a little longer until some of our regular summer staff returned through June and July. We expect to have her back at some point in the near future, but for now she has headed off to enjoy some summer wanderings. 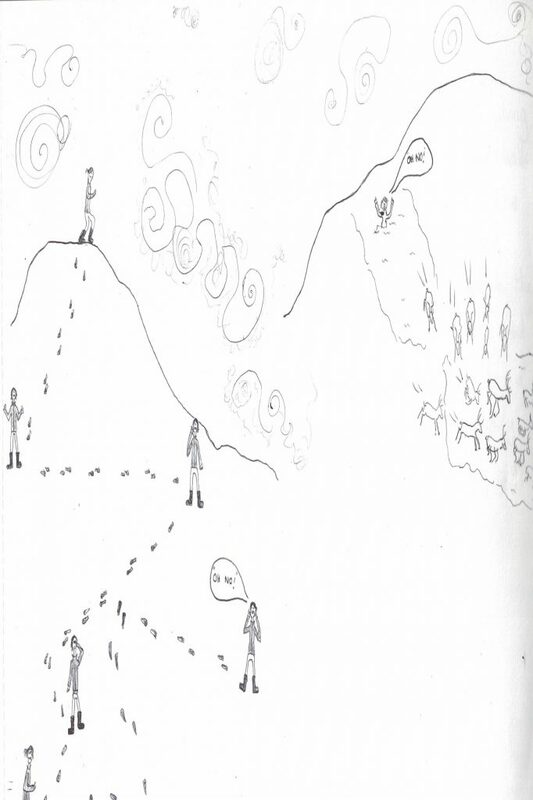 Before she left Kate wrote some lovely short stories about her time herewith some excellent drawings. Keep an eye out over summer for the next installments of her stories. Hopefully we can have Kate back here at Reindeer House in the autumn! During the first hour as a reindeer herder I had managed to become a very soggy, panting mess who was lost in the fog somewhere on windy ridge with not the foggiest where the herd had gone. I remembered thinking to myself; this has gone terribly wrong- I’m not even going to make it through the first day! It was mid-April and there were still patches of snow on the hills. My first sighting of the reindeer was brilliant, the whole free range of females were running towards us as we walked over a brow of a hill. It was an amazing sight, and one I won’t forget in a hurry, the reindeer looked beautiful and majestic in full winter white coats and impressive antlers. I was marvelling at what a lovely greeting we got, but Mel pointed out they probably came our way being spooked by something from the opposite direction. Then off we went, it was Mel leading the herd to the lower levels and me bringing u the rear, but unlike the agile reindeer that excitedly skip, gliding over the snow patches I ran behind panting and sank straight into a snow hole (Vicar of Dibley style). Up on my feet again I was wondering how on earth I was to keep up with these four legged creatures when 5 of them decided to go in the opposite direction. Standing in the middle of the groups, I thought I can’t lose reindeer on my first mission and went gallivanting after the strays. Of course being a herd animal , it really says it all , and the wanderers then did a full circle galloping off to join the rest, leaving myself lost in the fog. Luckily it wasn’t long until I found the herd again and the rest of the first day went more smoothly. 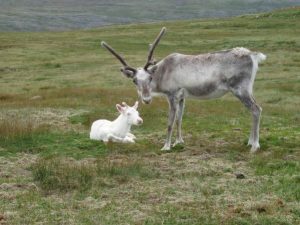 We worried over how she would cope out on the free range as she couldn’t hear her mother Glacier grunting to her, nor would she be able to hear the clicking of the reindeer’s tendons as they walk – a constant noise that encourages the herd to stay together. Equally she would not hear a dog barking or people talking and so be unaware of potential danger. Well, our worries were unfounded; she is now 12 years old, has successfully raised a number of calves and is very much alive and kicking. One advantage is she is really easy to spot on the hill, standing out like a sore thumb against the dark hillside, although admittedly in the winter, the white camouflage in deep snow helps to disguise her. Blondie with a muddy nose! 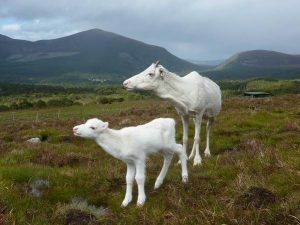 In 2010, Blondie had a male calf Lego who, like his mum, is pure white and also deaf. Not wanting to have too many deaf reindeer in the herd we decided not to breed from Lego, but at two years old Lego had other plans and managed to be sneaky and mate with Lulu, a seven year old, light coloured female. Lo and behold the next spring Lulu had a pure white male calf Blue, who, yes I am sure you can guess, is deaf too! Interestingly when we have been out in Swedish Lapland we have often heard the Sámi describe white reindeer as lazy and easily predated on by wolves. I think we can safely give them the answer why! 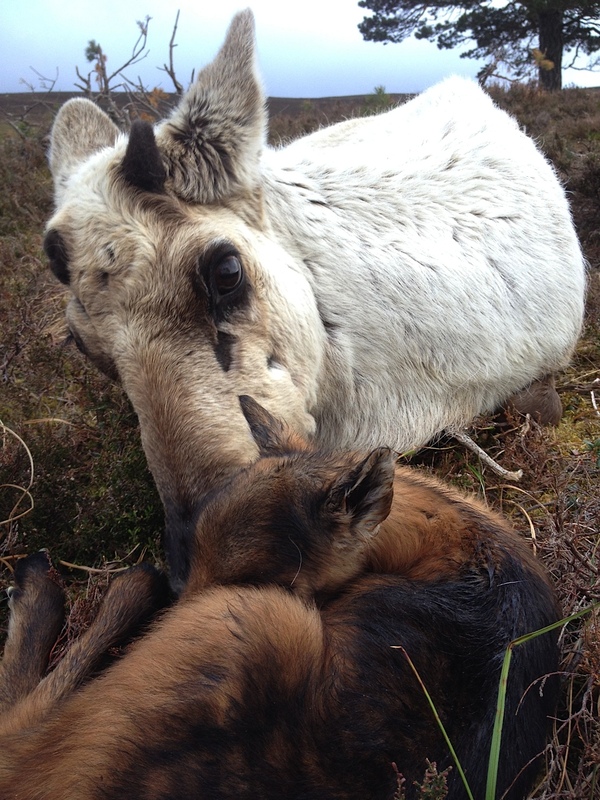 I was inspired to write about Fly as the featured reindeer for this blog as I followed her back from the far end of the hill enclosure with her new-born male calf back in May 2014. Fly’s name has a tenuous connection to the 2007 theme of the colour green: the gardener’s worst nightmare, greenfly. We shortened her name to Fly. As I followed her through the wooded slopes of Silver Mount Fly led me a tortuous route up and down the hill through deep heather and thick woodland. I’m not sure who she was testing, me or her calf. Her calf was amazing, struggling through the jungle of rank heather, scaling rough boulders and trying to keep up with his mum as she strode up the hill. I had to keep my wits about me as on a couple of occasions she appeared to completely vanish. Fly by name, fly by nature. There are only a few breeding females in our herd that get the gold star for breeding success and Fly is up there with the best of them. She calved first as a two year old, a strapping female calf who we called Custard (can you guess the link?!). Custard calved for the first time in 2012 then in 2013 she had a beautiful female calf, Cream (clever with linking names eh), so Fly at the age of only five years old became a granny. 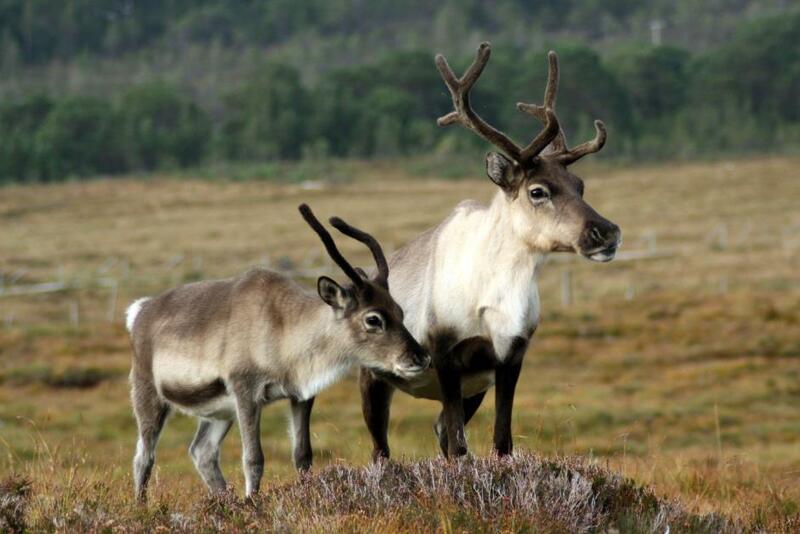 In the world of reindeer grannies can go on to be mothers too for many years and since having custard Fly has gone on to produce six strapping males: Dragonfly, Domino, Balmoral, Anster, Hudson and Aonach. Fly is coming up 11 now and having missed out on the rut last year she shouldn’t be calving this year. However, as she’s still one of the biggest and strongest females in the herd it’s possible she may well run in the rut with a male again this autumn if she stays in good health. Fly has maintained a remarkable record of being the first female to come to call every time Fiona has been out to bring in the free-rangers these last couple of months. 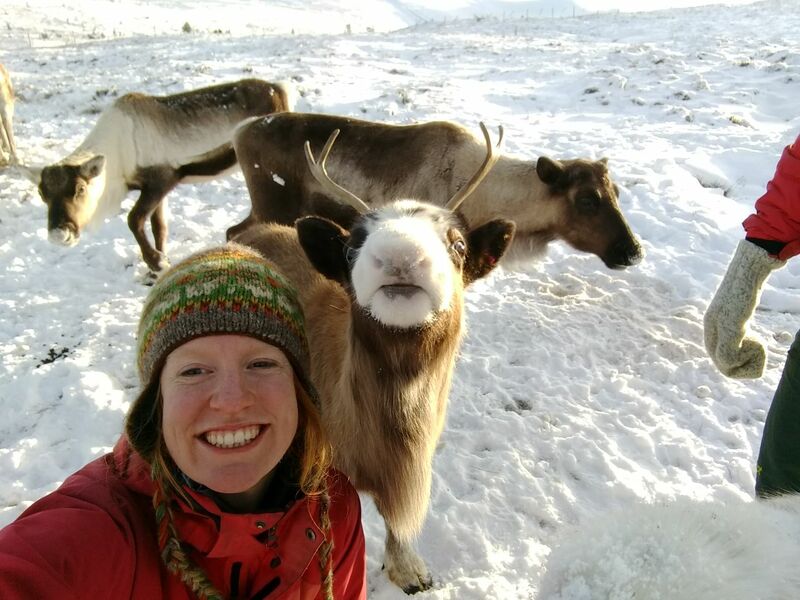 She is never far from the front of the group when the other herders call the reindeer down but she is always first when Fiona calls! I prefer the less tame reindeer. We have a lot of very sweet reindeer. They come right up to me and stick their noses right into the feed bag I have just carried up the hill…. Bumble, for instance…. I cuddle Dr Seuss and scruff up his nose hairs. Reindeer are wonderful creatures. So powerful and hardy, standing into the gales, looking into the snow that flies across the hill, this is where they live. The likes of Bumble and Dr Seuss have lots of adopters. Everyone loves Bumble. So cheeky, so adorable. 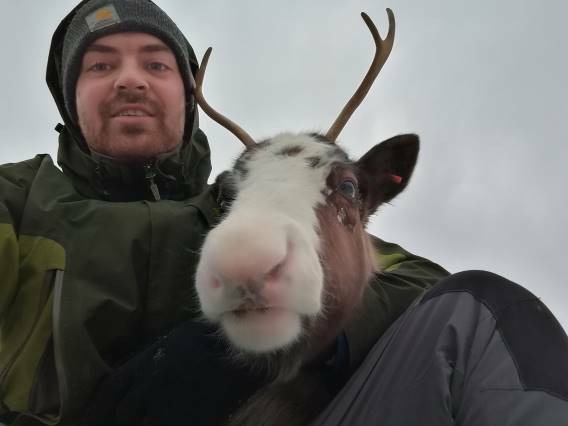 Dr Seuss came over for a cuddle with Reindeer Herder Chris one morning to shelter from the wind! 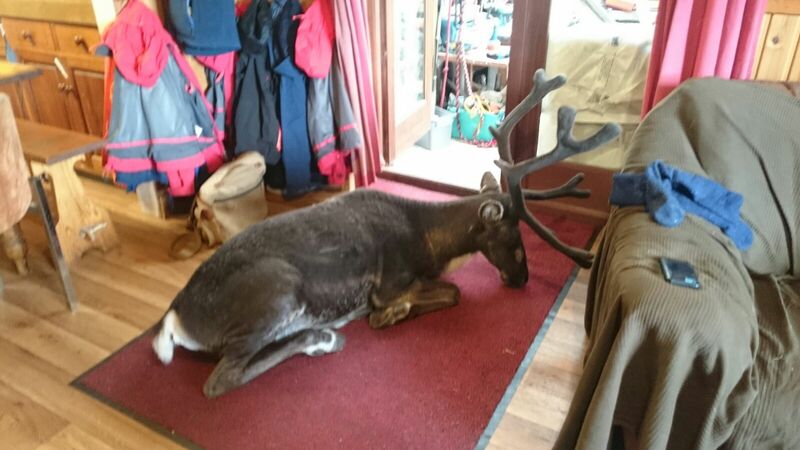 Occasionally someone comes into the shop and asks to adopt a real wild reindeer, a rebel, one who knows no boundaries. 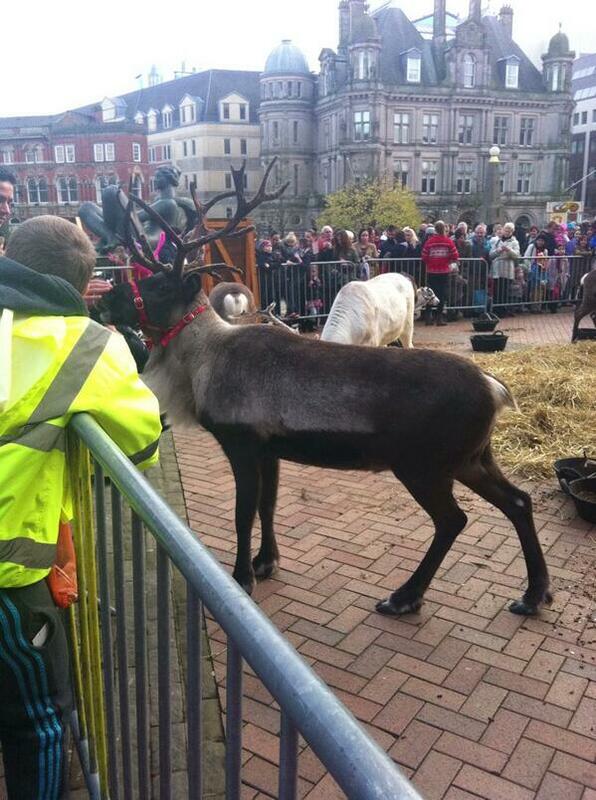 I breathe a sigh of relief and start rattling of my favourites, because I prefer the less tame reindeer. I prefer the ones at the back that no one ever sees or the ones that elude even us herders. Tambourine, Enya, Wapiti, Chelsea, I say, these are my favourites. These reindeer have a different beauty. These reindeer laugh at us mere humans. These reindeer have few adopters. Who wants to adopt a reindeer that will wallop you, or walk away, if you go near it? Champagne at home on the hillside. Bega in the enclosure in late summer 2016. My favourite when I first arrived was Bega. A pale coloured male that was born on the free-range and a real struggle to train. My other favourite was Champagne, a flighty young female, with distinctive spear like antlers. Both Bega and Champagne died before their time. 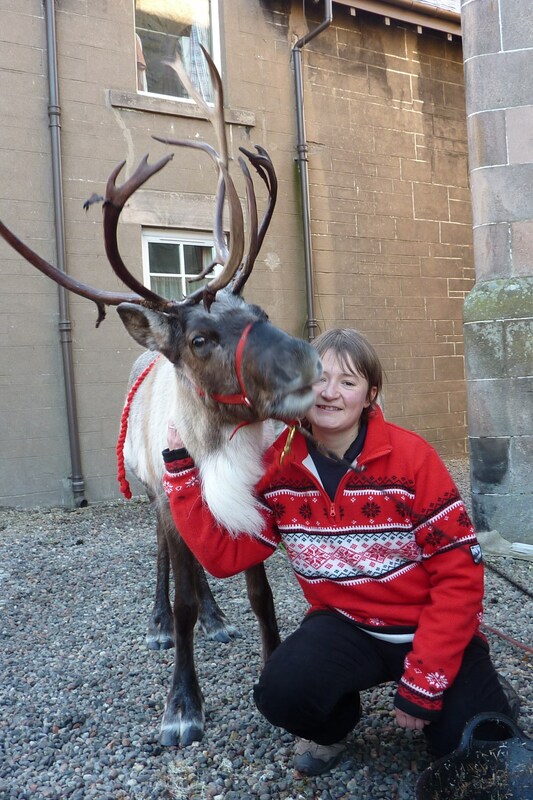 I guess this is perhaps what makes the herd so wonderful and interesting – we have both tame and less tame reindeer! 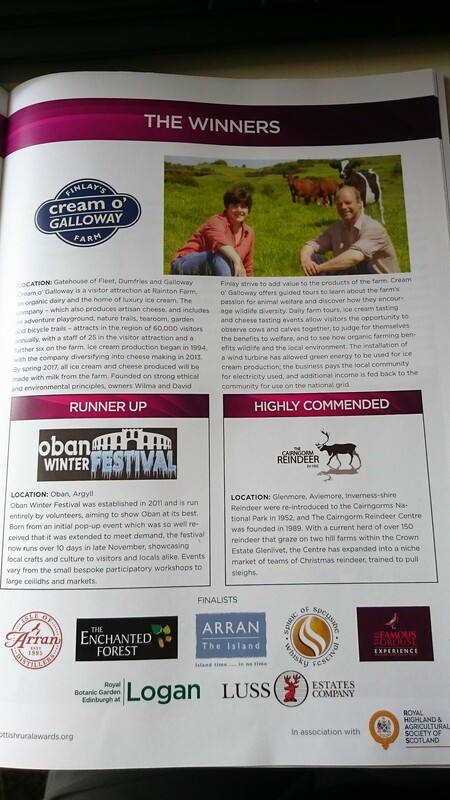 This winter we have prolonged periods of cold snowy weather, as I write this the weather forecast predicts it’s not going to be above zero during the next two weeks! 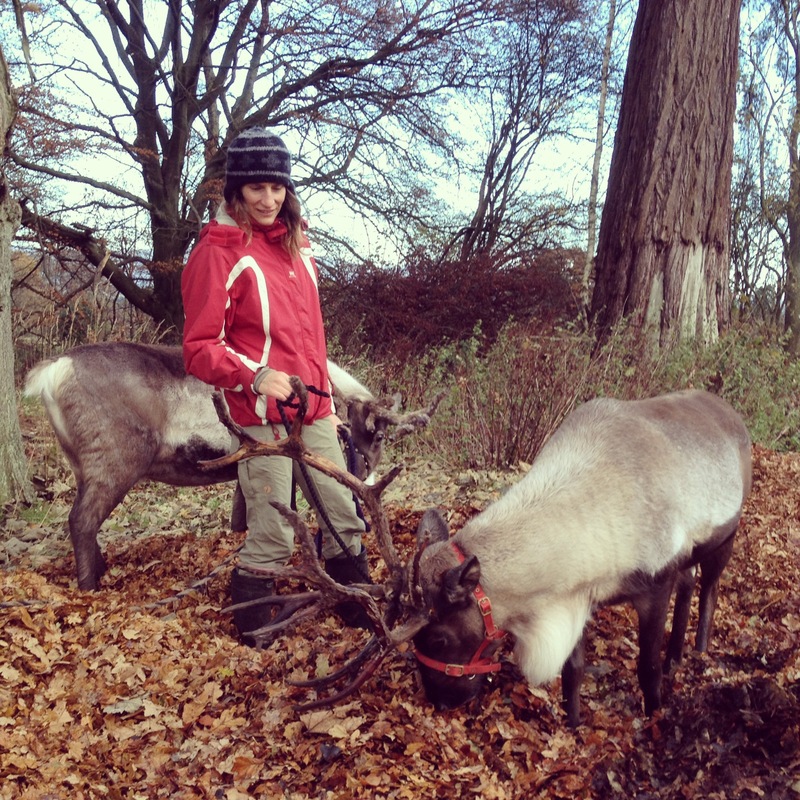 It’s pretty chilly for us herders even under our many layers, but for the reindeer it’s ideal (if a little mild!) and we have a big happy free-ranging herd. On Hill Trips we often talk about how reindeer are adapted to Arctic and subarctic life by describing their thick winter coat, large hooves, beards, and their amazing clicking back feet. However, in my opinion, one of the most wonderful and endearing adaptations of a reindeer is their beautifully soft velvet noses! 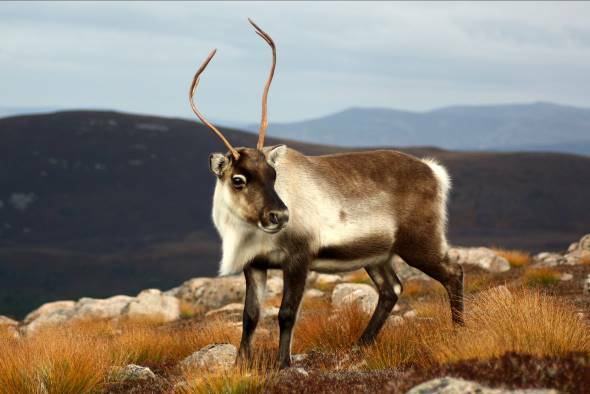 Out of the 40 odd species of deer in the world, reindeer (and Caribou) are the only deer which have hairy noses rather than shiny, moist ones. This prevents the build up of frost which would occur on a cold wet surface during exhalation; perhaps this is the reason why male polar explorers (and Scottish reindeer herders) often grow beards! However, the most special part of a reindeer nose is actually on the inside. 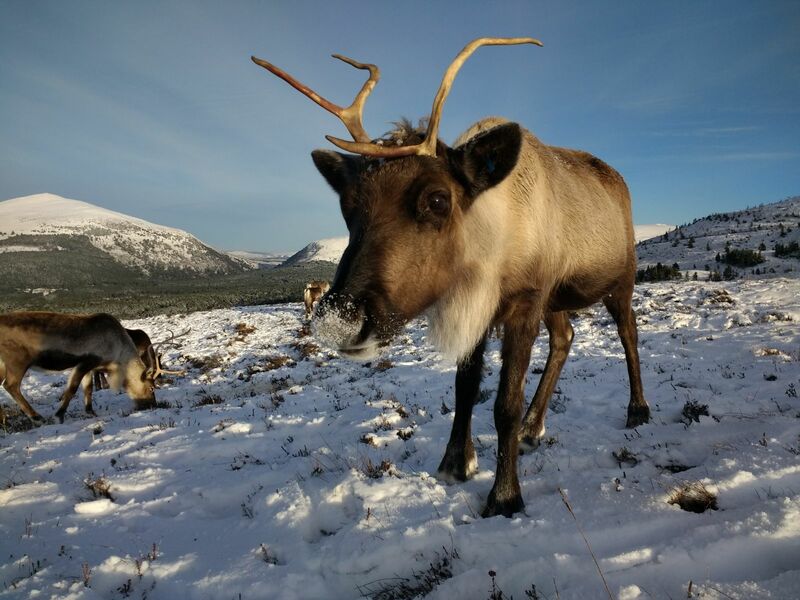 This blog will endeavour to delve under the cute furry exterior to hopefully show how truly remarkable a reindeer’s nose is…. 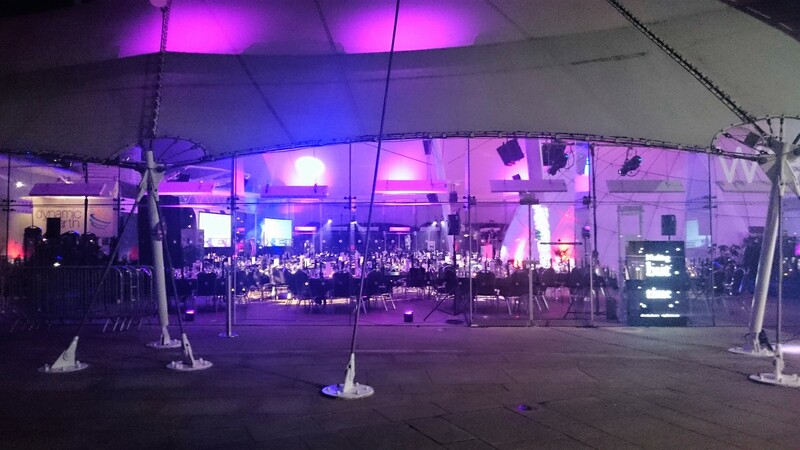 as well as a good excuse to show lots of lovely fuzzy photos! There is a complicated and highly specialised arrangement of cartilage, bone, fleshy bits, mucous membranes and blood vessels that make up their nasal passages. Together they form an extremely large surface area; the shape of which is often described as a ‘rolled scroll’ or sometimes a ‘seashell’. This specialised structure allows a reindeer’s nose to remain warm and retain moisture in freezing temperatures as well as allowing them to expel excess heat on warmer days. 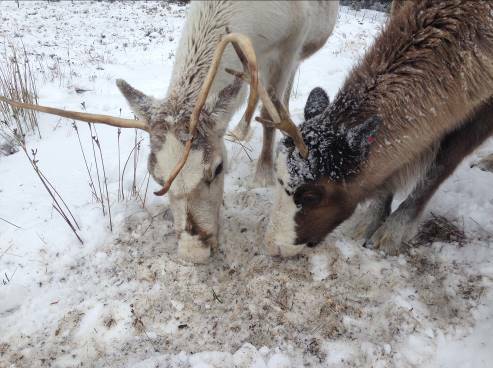 No cold noses for Sitini and her calf Pratchett as they munch on snow. 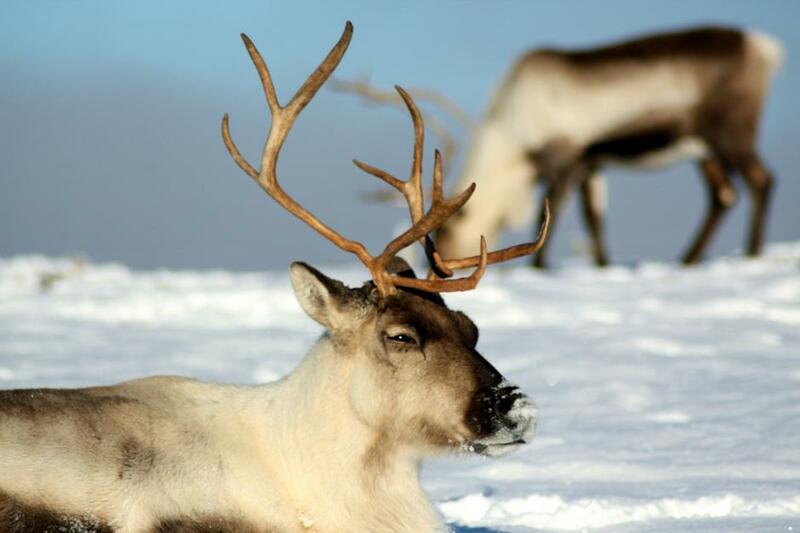 A reindeer would soon be chilled if freezing air was to reach their lungs on every breath. To overcome this they have the fascinating ability to change the temperature of the air they inhale before it reaches the lungs, and vice versa. This is all thanks to their ingenious nasal structure, which works as a counter-current heat-exchange system. For example, if the outside air temperature is -40⁰C, the temperature when the air reaches the reindeer’s lungs is about +38⁰C. In other words, they can change the temperature of the air an incredible 70-80⁰C in less than one second! 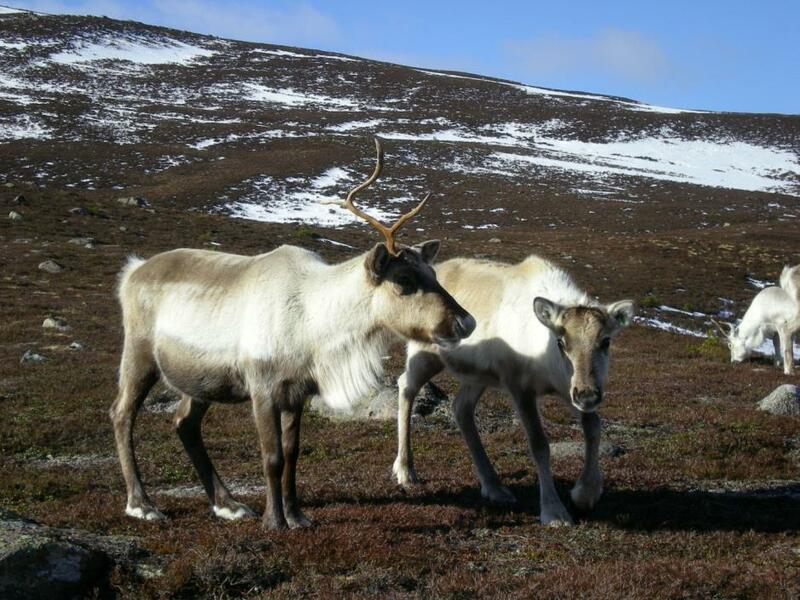 Additionally, winter air tends to be cold and dry, especially for reindeer that live in higher latitudes. In order for the heated air not to be over dry when it reaches the lungs, a bit of moisture is released from the internal mucous membranes into the air when the reindeer inhales. Move over Rudolph with your shiny red nose, I think that is pretty magic! On exhalation the opposite happens so a reindeer is able to cool its warm breath, in order to conserve as much body heat as possible. When breathing out they also conserve as much water vapour as possible; especially important when snow may be the only form of water they are able to get! So when it’s cold in winter, us meagre humans can see our breath as we exhale. 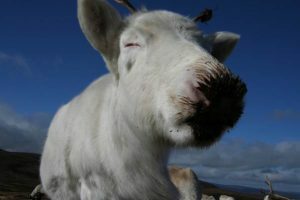 However, a reindeer standing at rest in sub-zero temperatures will have no visible breath steaming from their nostrils! That’s because air leaving a human nose is about 32⁰C and the water it contains condenses into visible water droplets as our warm breath meets the cold air. 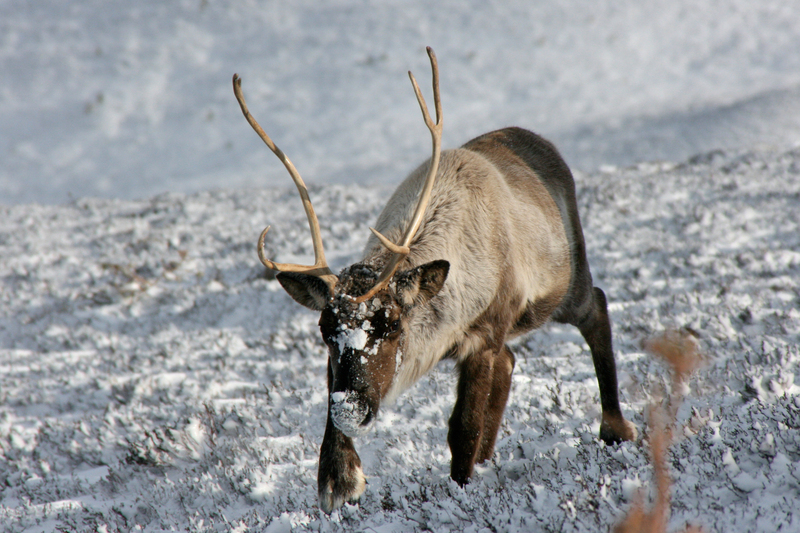 In a reindeer’s nose, warm air is cooled down by about 21⁰C before it is exhaled, saving the majority of the heat. 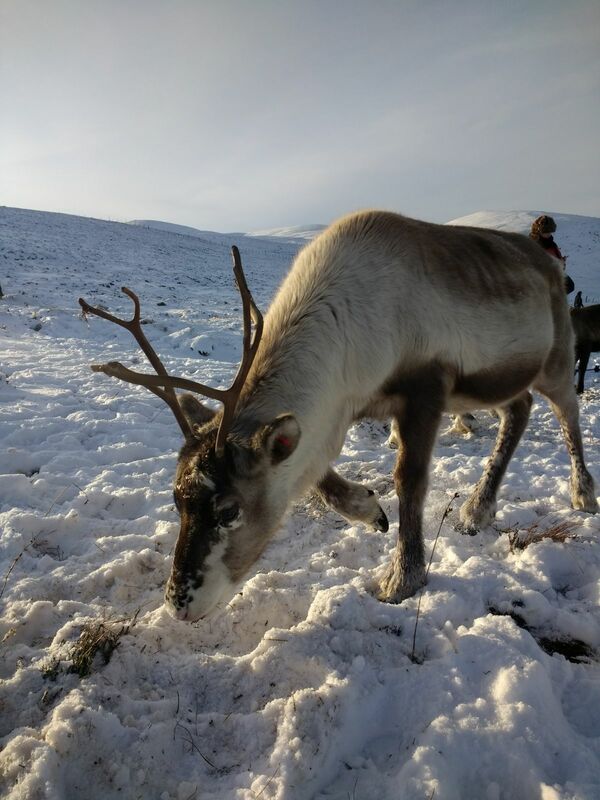 The mucous membranes in the snout recover the moisture, enabling the water in the air to condense inside the nose which then trickles into special folds which direct it to the back of the nose and into the throat, meaning the reindeer exhales drier and partially cooled air. Beneath Christie’s pretty nose lies an amazing complicated anatomy! Second doing his best Rudolph impression whilst out on tour last Christmas! 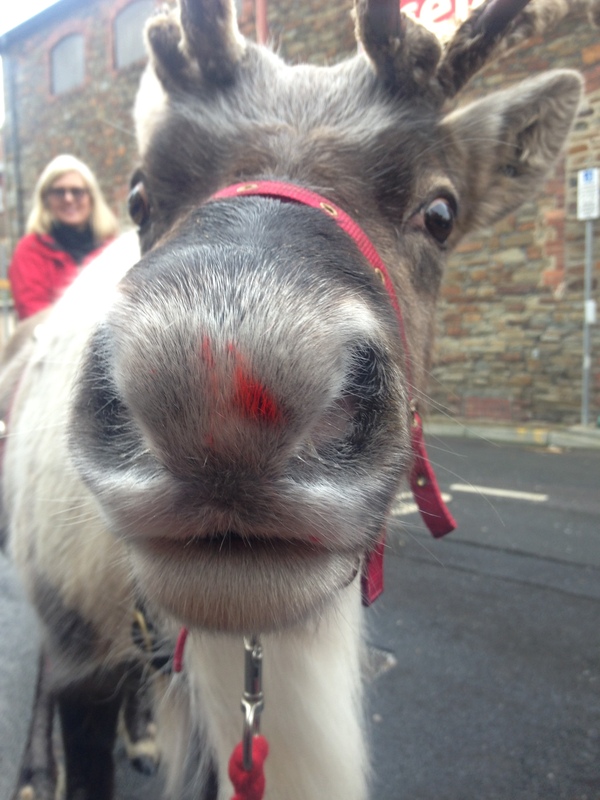 Reindeer noses can also be very useful for sleeping on, as Fergus is demonstrating her! 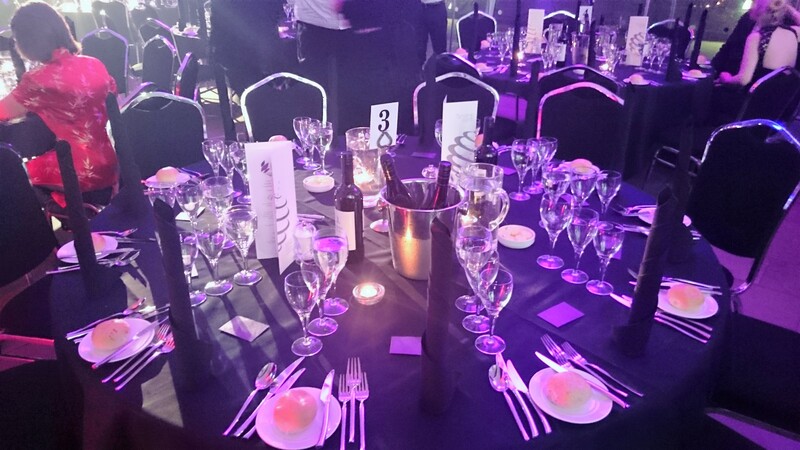 Last but not least…. Dr Seuss’s gorgeously handsome super soft snozzle! 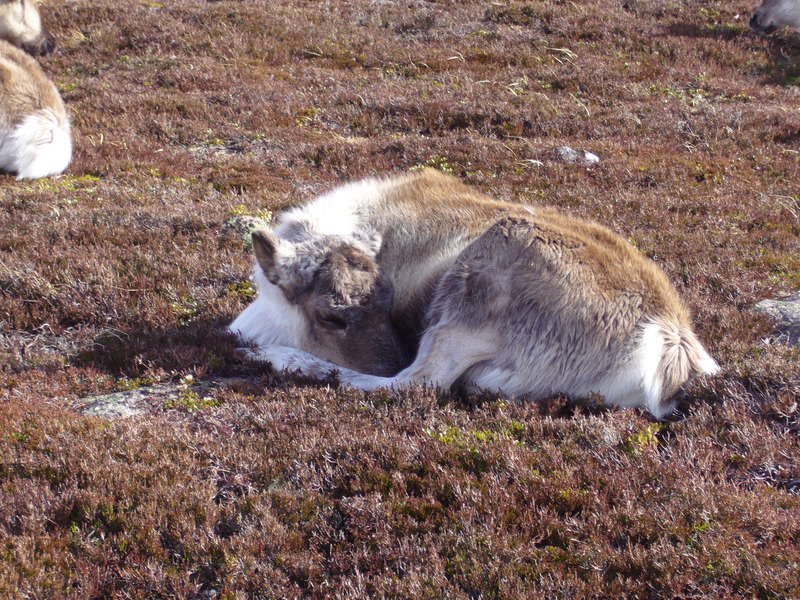 Reindeer calving: Can we predict whether there will be more males or females born? 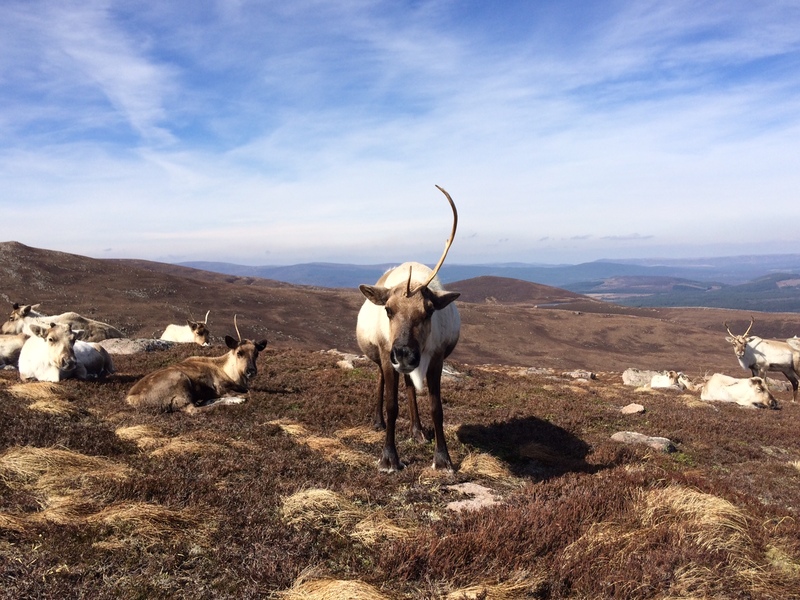 It has been an exceptionally mild winter here in the Cairngorms; the ski season never really seemed to kick off, the herders are missing the snow and it has just felt a bit wetter and warmer than usual. I’m sure you’ve noticed how early the snowdrops and daffodils seem to have emerged and we have noticed that the hills are looking a bit greener with the heather and deer sedge starting to grow already. Looking at the Met Office summary for winter 2016-2017, temperatures are up about 3.0°C on average (average being data from 1981-2010) in the UK. This blog is really just an excuse to look at cute calves. 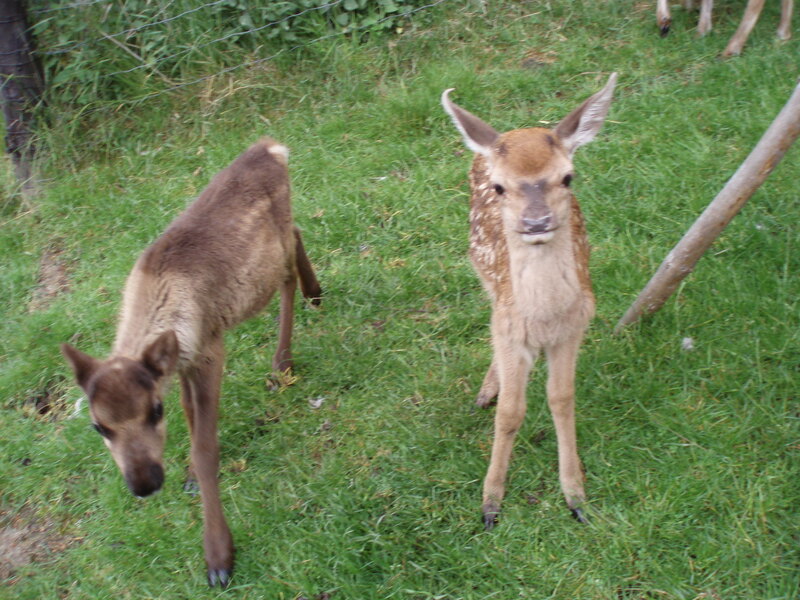 Here’s a reindeer and a red deer calf, both being hand reared. 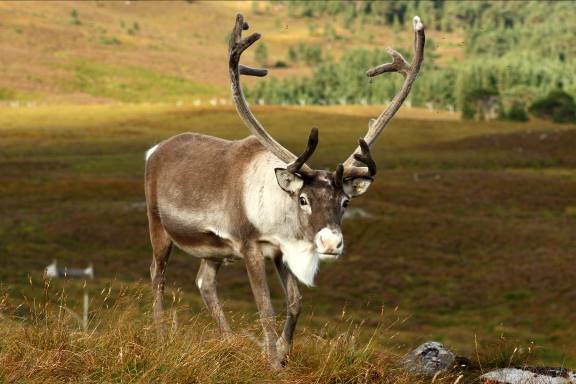 For the reindeer, this warming winter could have lots of effects, and we have recently heard of the reindeer in the Yamal peninsula, Siberia, starving to death due to increased rainfall in the autumn freezing and leaving a thick layer of ice impenetrable to them for foraging. Our reindeer seem to be coping just fine and it has not frozen here enough for them not to reach their favourite food, lichen. 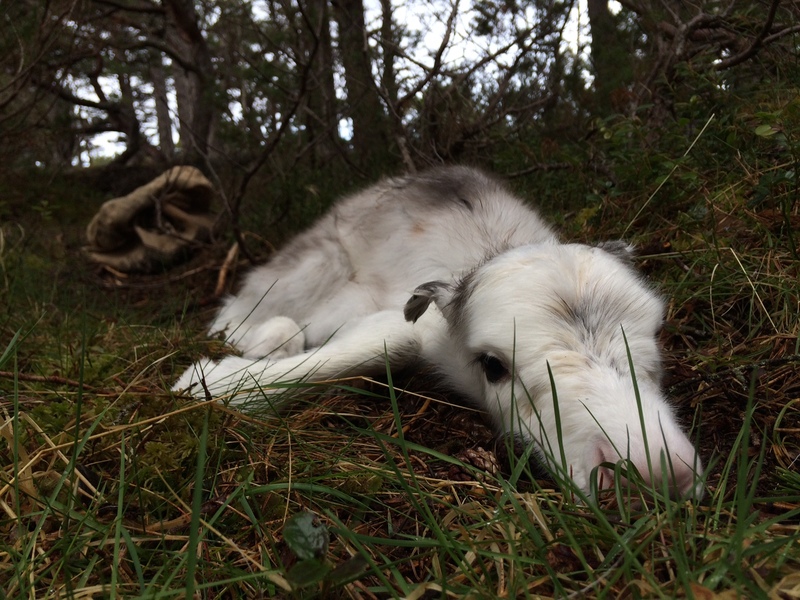 However, research done by previous reindeer herder Heather Hanshaw has shown that weather conditions do definitely affect the proportion of male to female calves born in the spring. Since calving will soon be upon us, I thought it might interest you to know about this research and what our mild winter may mean for us in the upcoming weeks. 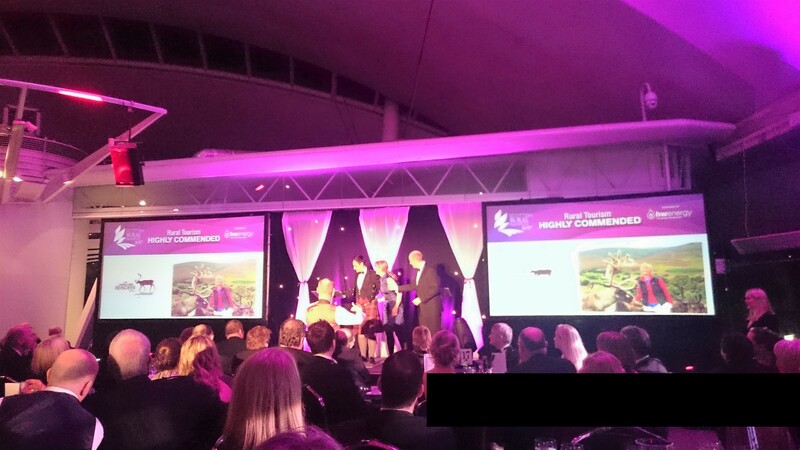 Heather studied Physical Geography at Edinburgh University and in her final year needed a project to study. 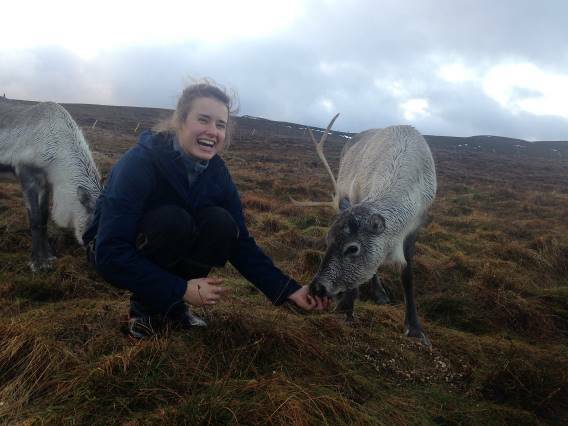 Of course, having an interest in climate as well as reindeer, and having worked at the Reindeer Centre, a project about how climate affects them was a natural interest to Heather. 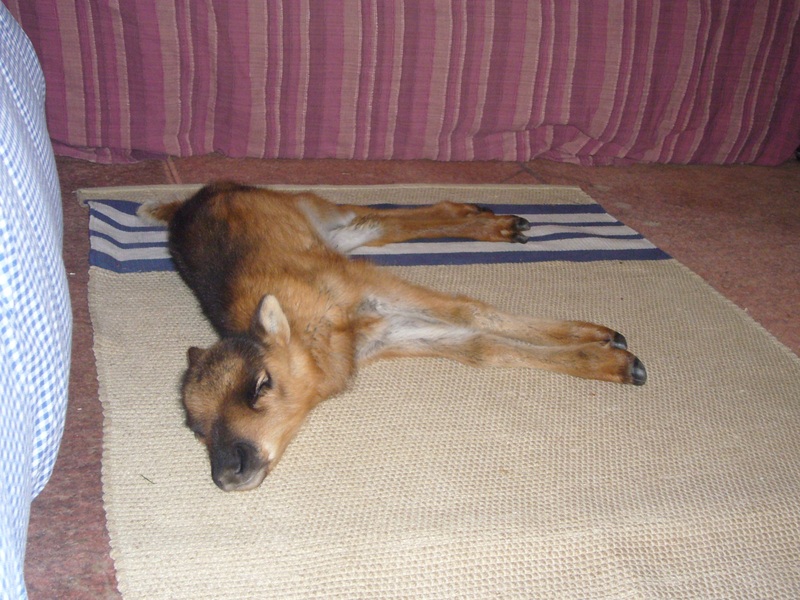 She knew that Mr Utsi and Dr Lindgren had been very meticulous about the data kept on calves born in the Cairngorm herd, and climate data was easily enough accessed, so Heather devised a project determining if weather (temperature and rainfall) had any effect on the proportion of male to female reindeer calves born. 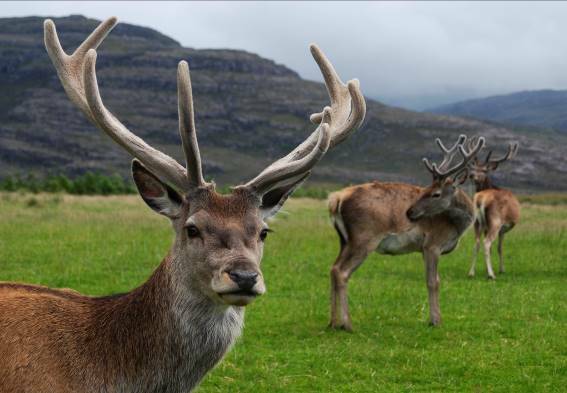 A similar study was conducted with Red deer on the Isle of Rum, and their study found that milder winters led to more male calves. Would it be the same or opposite of Rum, or would weather have no effect on the Reindeer? It turns out that Reindeer are similar to Red deer and when the winter temperature increases, so does the proportion of male calves. So, will that turn out to be true this year? With only a few weeks until calving begins, it will be interesting to look at whether we have lots of male calves this year. Last year the winter seemed fairly average, possibly on the warm side a little, and our calving ratio was almost perfectly 1 male to 1 female, so it will be really interesting to see if this mild winter has had an effect on what will be born this May. 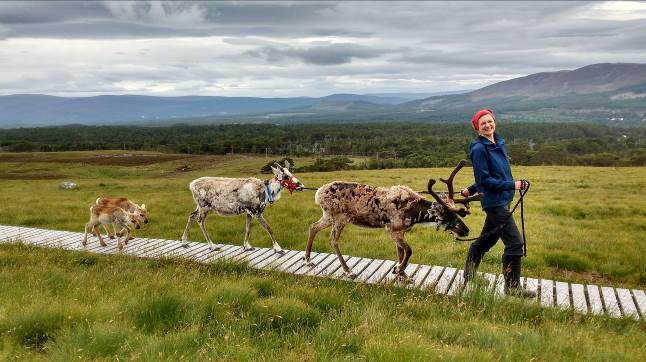 The title of reindeer herder does not just include herding reindeer. In the last few months, I have not only found out how to very slowly herd reindeer down a hill and keep the attention of a group of 50 people through a health and safety talk, but have also found myself painting arctic scenes, fixing fences, hoovering, carrying wood up a hill, lighting fires, fixing biomass boilers and hand-writing many a letter. Reindeer herding also includes, much to my delight, drinking copious amounts of tea and, on sunny days, eating lunch outside whilst bathing in the sun. 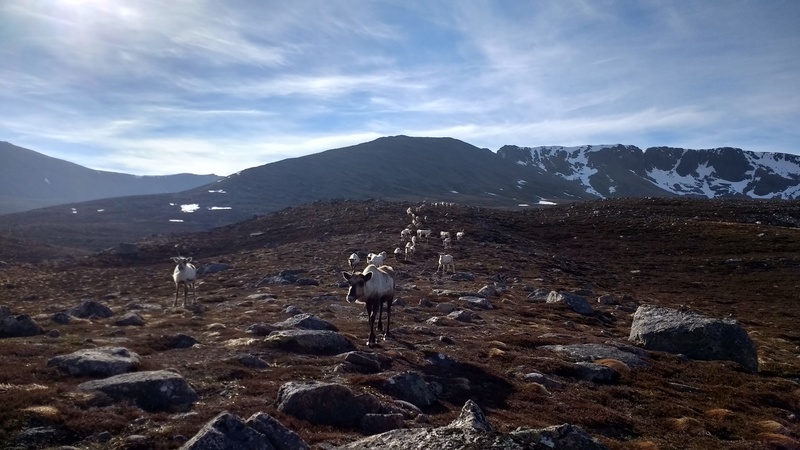 Days can be both hectic and peaceful, split between manning a bustling shop to walking down a quiet hillside with a herd of reindeer in tow. 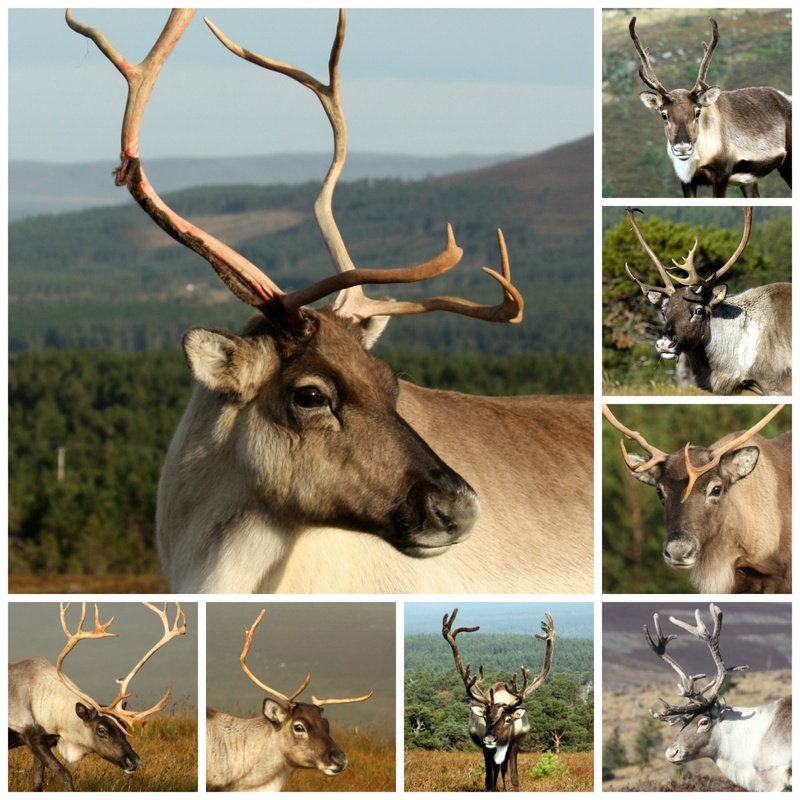 There are a lot of reindeer in the herd, and so A LOT of reindeer names to learn! Much of my time on the hill until now has been spent squinting at different reindeer and racking my brains to try to remember who on earth it is. 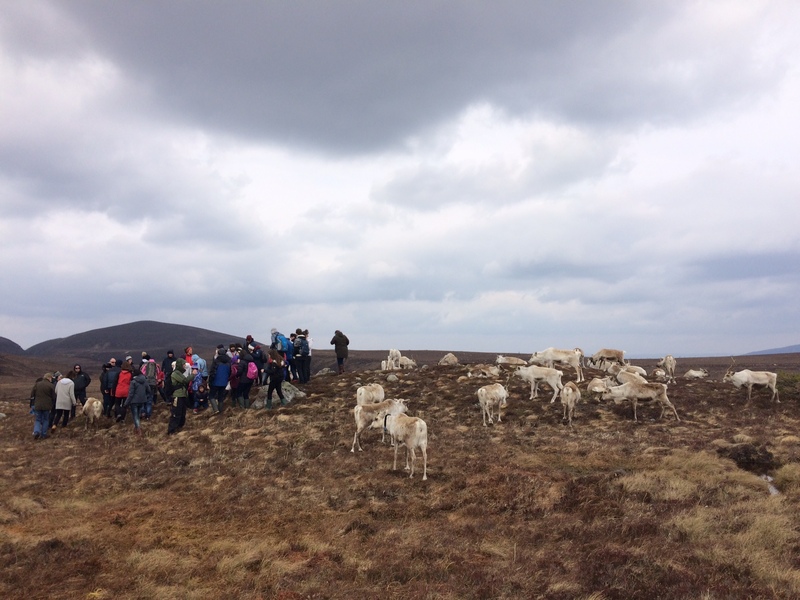 With some hints from other herders, and no help from the reindeer losing their antlers at any given opportunity, I am finally on my way to recognising the 60 that we have here on the Cairngorms at this time of year. 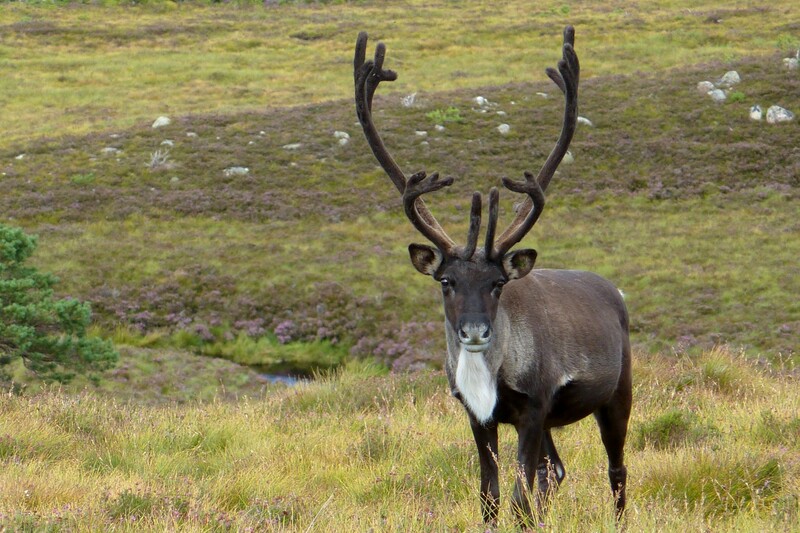 But alas, the day the rest of the herd turning up is near approaching..
Reindeer are constantly full of surprises! Some days they come bouncing down the hill at the slightest whisper of a call, some days they stubbornly sit and stare you out from an unreachable hill, and some days they just cannot be found. They are characterful, frustrating, lovable and peaceful animals all at once, and I feel the luckiest person to be able to work with and around them. 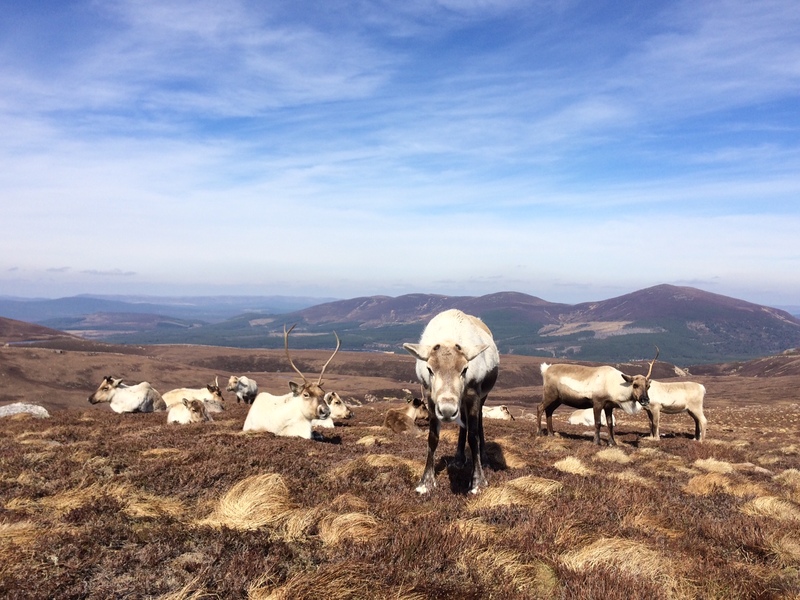 The 67 reindeer here on the Cairngorms coming down to our call, on a sunny friday morning. There are a lot of words in the English language that I do not know. Before becoming a reindeer herder, I never knew it was possible to ‘groak’, ‘twattle’, ‘lunt’ or be a ‘sluberdegullion’. 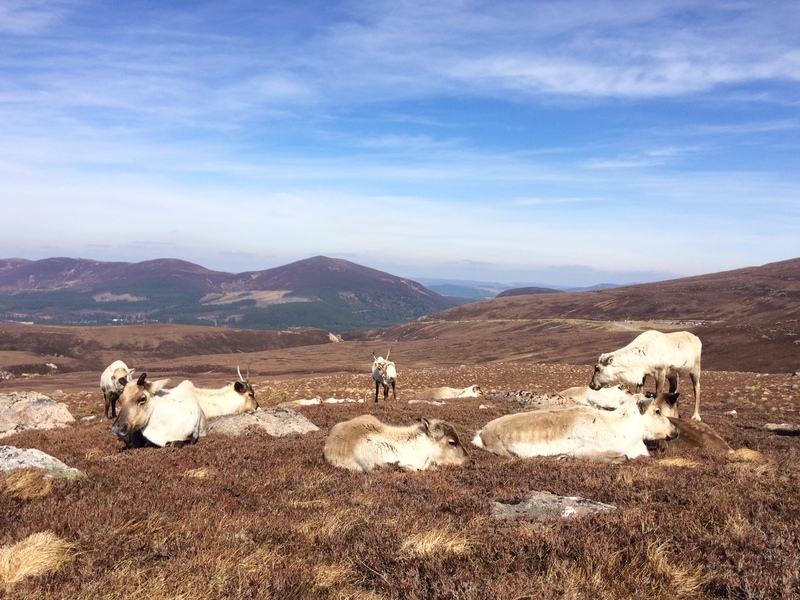 But with a board in the office that lists all the words you never thought you’d need, I am learning the true meaning of being a herder..
As the year rolls from March into April, here in the Highlands we start to see more definite signs of spring. The snowdrops have of course been and gone, but now the daffodils are out in their full glory, along with primroses and crocuses. There is a noticeable difference in the grass too – during March there is very little colour in the fields, everything is a washed out browny-yellow. But as April approaches, I start squinting at the verges – is there just a hint of fresh green there? By now there is no doubt, the Paddocks and garden are looking almost lush and their first cut is fast approaching. 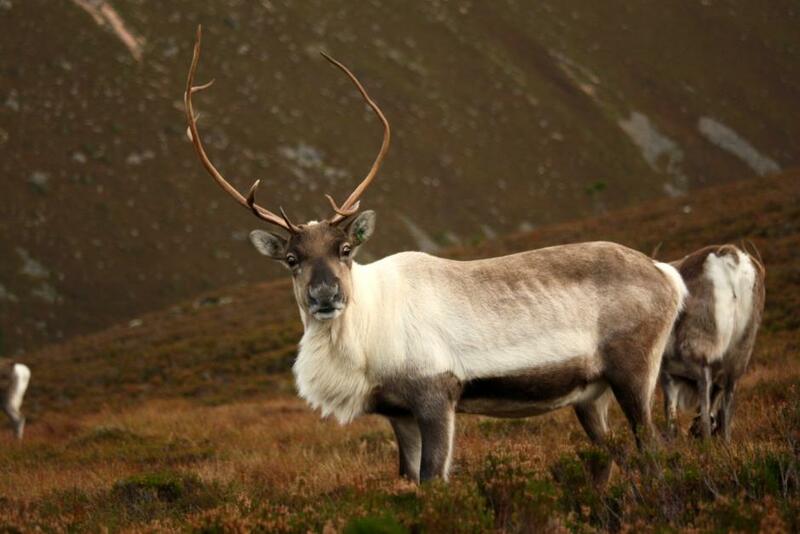 For all of you down in England, I do appreciate that you’ve probably had the lawnmower out several times already, but we have the longest winters in the UK here – one of the reasons it is still a suitable habitat for reindeer. Relaxed reindeer with a glorious backdrop. Jenga has the best start on her new antlers of the females. Up on the mountain, the deer grass is breaking through, and the first migrant birds are arriving back from their winter holidays – there were three ring ouzel squabbling their way along the path as I walked out to feed the herd this morning. I’ve heard tell that the first swallows are in Devon (it’ll still be a few days until they pass by us) and the distinctive osprey pair are back at Loch Garten – we popped along the other day and were glad to see EJ hanging out on the nest, and a brief visit from her long-term partner Odin. Last year I watched a pair circling over the hill enclosure, just checking out Black Loch perhaps before deciding it wasn’t suitable to nest at. Old girl Lilac still looking superb at nearly 18 years old. April is a fun time to spend with the reindeer, with anticipation in the air. The females tend to be relaxed and lazy, with heavy tummies and enjoying the fresh grazing starting to come through. 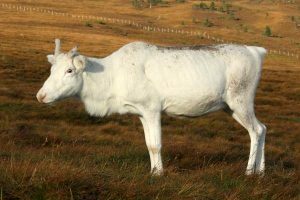 Their coats have lost their sheen and are starting to moult, and most of last year’s antlers have fallen off, with some making good progress on this year’s set. 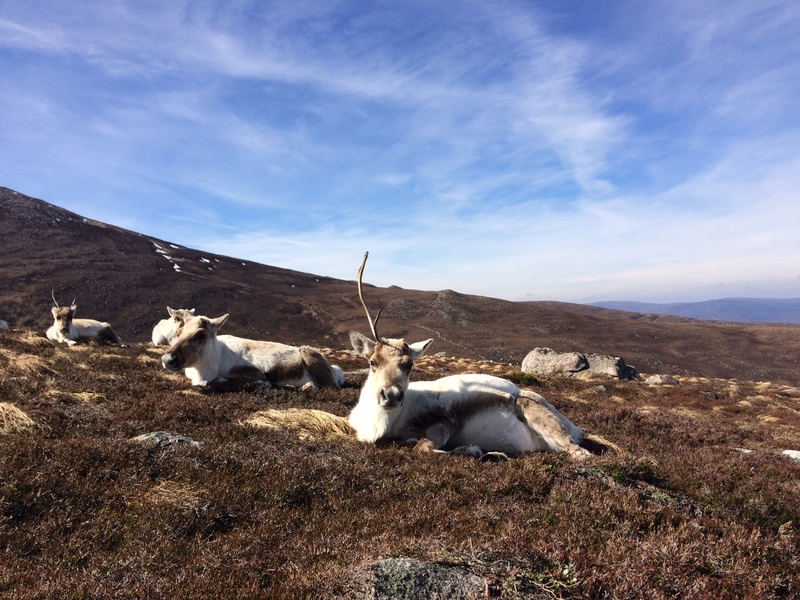 Slightly less relaxing (for us, but not the reindeer) is the start of the Easter holidays, with its associated rush of visitors. Having a limit on numbers for the Hill Trip has certainly made our lives less stressful though and hopefully improves the experience for our visitors too – just a reminder to come early if you’re coming for the Trip to make sure you get tickets! A group of visitors learning about the reindeer, who are delighted to pose whilst they wait for their dinner. The other slight bit of stress is that all of us herders are assessing who we should pick for our calving “bet” – the annual game of trying to guess who will calve first. Us herders spend a lot of time peering at bellies and potential developing udders, trying to work out who is pregnant and who is likely to calve early. There isn’t any money put down, and indeed no prize for winning, but the person whose reindeer calves last has to swim in the loch! The decisions are mostly made now, but I’m already slightly apprehensive that I’ve made the wrong choice – suddenly everyone else’s choices appear much rounder in the belly department than mine… I’ll stick to my guns though with fingers crossed! Every time I look at Dixie’s belly I worry that I’ve picked the wrong reindeer for the calving bet! Normally, spring is a welcome relief after a long hard winter… this year I can’t really claim that as it’s been a very easy winter with little snow, but it’s still lovely to see the lengthening days and warmer temperatures, with the promise of a (hopefully) long, glorious summer ahead. Fingers crossed that it’s warm to make for an easier swim if I end up losing the bet!